I can never resist a recipe for preserving anything, so this one for cured egg yolks, from last week’s Guardian Food intrigued me. I enclose the recipe below; it is very simple. However my cured eggs just tasted very salty and sweet and stuck to my teeth. Possibly they weren’t dry enough, but grating them was difficult and made no difference. Chopped hard-boiled eggs easier and probably better. Grated cured egg yolk – from the Guardian, Saturday 18th Jun, 2016. While waiting for these TwinnyDip beauties to cure (four days – making this recipe by far the longest prep the Swap has thus far encountered), I was plumping for the expedient simplicity of Lauren Kisby’s rosti (to follow) as winner. But then, when the yolks were at last ready to grate and sprinkle, their glowing canary hue lighting up my kitchen, I was torn. For flavour and looks, it is the perfect garnish. I used it to make a homemade furikake (savoury rice topping), adding yuzu chilli flakes, black sesame seeds and tendrils of nori. I was so excited, I had to call my mother. 1 Combine the sugar and salt in a mixing bowl. 2 In a small, lidded container (big enough for all four yolks to sit in one layer without touching each other), spread half the sugar-salt mixture. Carefully make four egg yolk-sized hollows in it. Then, one by one, separate the eggs, setting the white aside. Place a yolk in each hollow, ensuring they stay intact – be very careful not to break the yolks. Ensure there is salt and sugar all around each yolk, then sprinkle the remainder – very gently – on top of the yolks, to cover them completely. Cover the container with the lid and refrigerate for 4 days. 3 Take the container out of the fridge and carefully take each yolk out, removing as much of the sugar-salt mixture as possible. Run each yolk for no more than a couple of seconds under a cold tap to remove any excess sugar-salt mixture stuck to the surface of the yolks. Pat dry carefully using kitchen towel. Grate on the fine side of a box grater atop seafood, soups, garlicky braised veg, bitter leaf salad – essentially, wherever a poached egg might do. 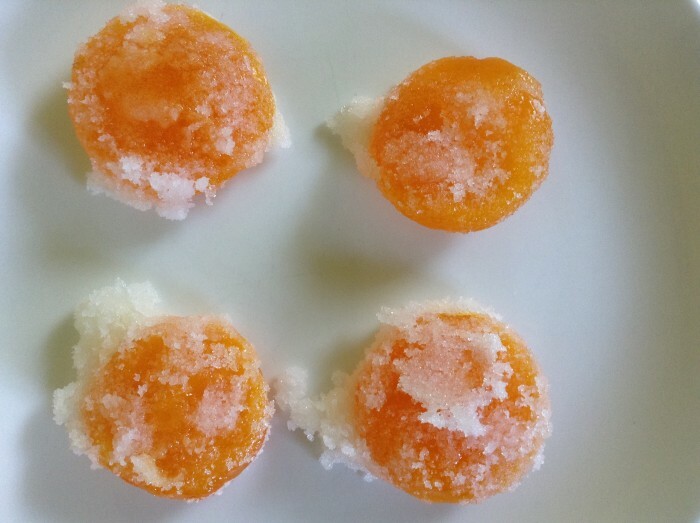 The cured yolks will keep in an airtight container in the fridge for up to 1 month.